07.12.2014: LIVE G-Fest Podcast – The SOUND OF MONSTERS! 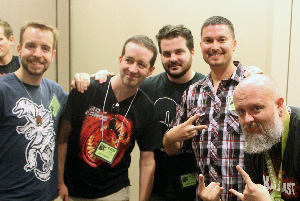 Chris Oglio, Jim Figurski, John DeSentis and Erick Homenick join Kyle for a very special live podcast at G-Fest XXI. G-Fest XXI is underway! And let me tell you, it has been an awesome convention so far. The show notes will be a bit brief today because I need to get this episode uploaded before the insanity of my Saturday really kicks in! For our first real discussion about the composers behind these kaiju films, I was joined by Jim Figurski (contributor to GodzillaMonsterMusic.com), Erick Homenick (webmaster of AkiraIfukube.org), John DeSentis and Chris Oglio (from the Ifukube 100 concert happening tonight!). I found it a fascinating discussion and I hope that you all enjoy it as well. On somewhat of a side-note, I have launched a kickstarter campaign and I need your help to fund an indie documentary in which I will fly to Tokyo and capture the Big Godzilla Special Effects Exhibition and hopefully interview some key cast and crew members from Godzilla’s sixty year history. The name of the documentary is HAIL TO THE KING: 60 YEARS OF DESTRUCTION and really hope the you will believe in this as much as I do. There are some fantastic perks for donating and I have assembled a great team to help me bring this to life. It cannot happen without your support. Thank you all in advance for your help and continued support over the years. Now, let’s break out the Day 2 Fest-ivities!